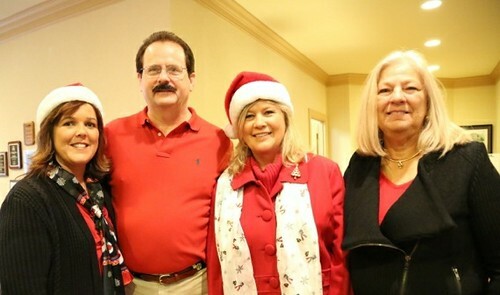 LEXINGTON, Ky. — Santa and his helpers were out in full force during the handoff of donated Christmas presents from the Home Builders Association of Lexington to members of the Kentucky National Guard last week. The toy drive was part of Operation Military Cheer, an effort by the Kentucky National Guard’s Family Assistance Center to ensure that the children of Kentucky’s military families across all of the uniform services – active duty and reserve, Army, Navy, Air Force, Marine and Coast Guard – have a memorable holiday season. Don Sullivan represents Home Builders Care, the charitable arm of the Home Builders Association of Lexington, the organization charged with collecting the toys for the drive. 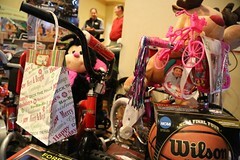 Together with associates of the Home Builders Association, the Remodeler’s Council, local real estate offices and the public, the group collected 1,200 toys and 22 bicycles valued at more than $6,000. An additional $900 in cash and gift cards were donated as well. 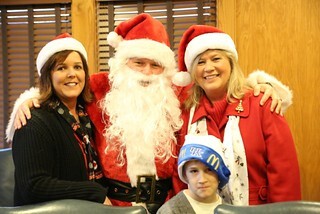 “Santa” even showed up to express his gratitude for the toys collected during the drive. “It’s so awesome to see such an outpouring of support from the public to our military families,” said Capt. Rob Cooley, who switched uniforms from green to red in celebration of the occasion. The father of five children himself, Cooley understands the challenges facing today’s parents. Operation Military Cheer supports military families across all the services, active duty, reserve and National Guard. To find out how you can become part of Operation Military Cheer contact Cindy Culver or Linda Jones through the Family Assistance Center hotline at 1-800-372-7601.